A finely ground powder of the dried leaves of a special green tea plant, traditionally used in Asian tea ceremonies. Matcha is a finely ground powder of specially grown and processed green tea used in traditional Chinese and Japanese tea ceremonies. The green tea plants are shade-grown and in their processing, the stems and veins are usually removed. Matcha is used in flavoring and dyeing of certain foods such as green tea ice cream, Japanese rice cakes called mochi, and Japanese buckwheat or 'soba' noodles. 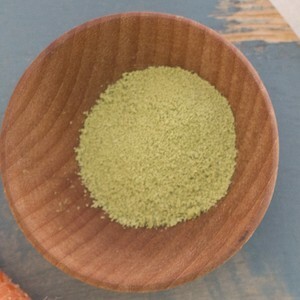 There are many factors that help determine the grade of matcha powder. Some of these include tea color, texture, quality, density, fineness of the ground powder, how it was ground up and treatment prior to processing. Matcha, like green tea, is also packed with antioxidants, particularly an organic compound called catechin, which is considered to be the most potent antioxidant. A catechin called epigallocatechin gallate (EGCg) makes up 60 percent of the antioxidants in matcha green tea, and it is known for its cancer fighting properties. Matcha also has the amino acid L-Theanine, which helps with relaxation, and boosts the production of dopamine and serotonin, which improve mood, memory and concentration.